I guess you know you’re a true foodie when you get excited to go to the grocery store! But honestly, one of my favorite places in Philly is the Whole Foods by the Art Museum. Since I had a rare Friday afternoon off, why not start off my weekend with a little treat? To be fair, I did actually need some groceries, but I couldn’t wait to hit up the amazing prepared foods. I especially love this location because it includes some top local restaurants, such as Dizengoff and Servino. That Friday, November 3rd also marked the opening of Goldie and Federal Donuts. Perfect! I decided to walk up because it was such a nice day, and I was starving by the time I got there. It was towards the end of the lunch rush, but the restaurant area was still packed. Instead of waiting, I went to the salad and hot bar and filled up two containers to the brim. For dessert, I decided to try the tehina shake that Goldie is so famous for. I figured that since there’s a Federal Donuts on campus, I wanted to get something different. If you’re not familiar with tahini, it’s a condiment made from ground sesame seeds commonly found in Middle Eastern cuisine. It has a slightly nutty flavor, reminiscent of peanut butter. I love using it in sauces and dressings, but I had never tried it on its own like this. The shakes came in original, banana, and Turkish coffee, and I opted for the original. After the first sip, I was in heaven! The tahini hits you immediately and then the nutty aftertaste sneaks up on you. 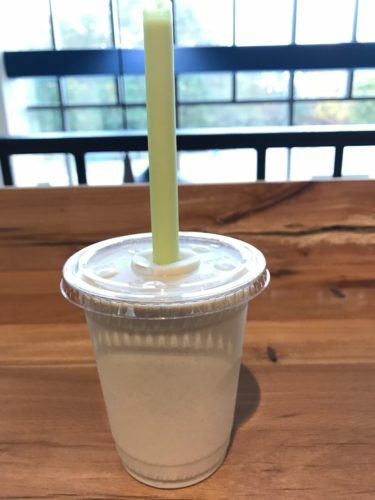 The shake is super rich and creamy but not overwhelmingly sweet, and it’s just the right consistency to slurp up with the straw. Once I started drinking it, I couldn’t put it down! In addition to the tehina shakes, Goldie is also known for its falafel, served either in a pita or on a salad. It’s actually an all vegan restaurant, using no meat or dairy products, but you definitely don’t feel like you’re missing anything. 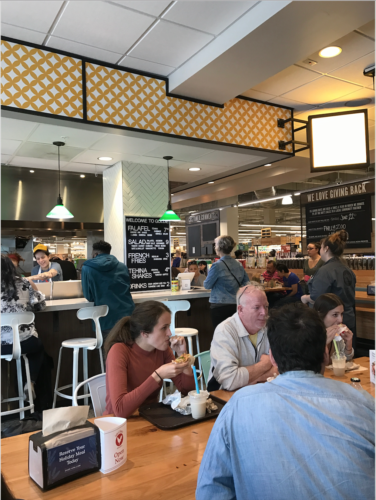 In addition to being in Whole Foods, they have another location in Center City on 16th and Sansom. Goldie has definitely piqued my interest and I can’t wait to try other things on its menu!